Today is a day for celebrating unseen heroes. Those faithful friends who make our lives that little bit better, but too often go unrecognised. We’re talking, of course, about black cats. 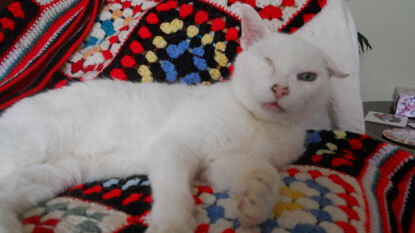 Loyal, loving and truly heroic, these supercats take a tragic 13% longer to rehome than their colourful counterparts. That’s why every year on 27 November, we put black cats in the spotlight and remind the world why these dark-furred defenders deserve a loving home. What is National Black Cat Day? Perhaps potential cat owners are swayed by outdated and untrue superstitions. Or maybe they simply notice colourful cats sooner when visiting a shelter. Either way, black cats often spend a long time waiting for their perfect human sidekicks. We believe in better for our black cat heroes. That’s why we’re here to debunk myths and raise awareness about these elegant, affectionate creatures. What makes black cats heroic? While legends about black cats being unlucky are categorically untrue, we can confirm that these creatures are pretty super-powered. From their powerful feline physiques to their unique place in myths and legends, these creatures are worthy of recognition. Here are just a few reasons why all black cats are heroes. If you’ve fallen in love with our black cat heroes, and want to welcome one into your home, you can search for the perfect feline friend with our find-a-cat function. Search by location and lifestyle, and make a world of difference to a beautiful black cat today. Grab a gift for a good cause at our Cats Protection Black Cat shop. From homeware to accessories, we’ve got black cat accoutrements for the whole family - the perfect way to help make our black cat heroes more visible. Text KITTEN66 to 70660 to donate to our heroic team of Cats Protection volunteers, who help over 200,000 black cats and kittens a year around the UK. Your donation will help find loving homes for cats of every colour. And of course, if you’re the proud sidekick of a black cat hero, today is the day to let them know just how much you appreciate them. Whether it’s extra cuddles on the couch, a new toy to play with together, or something special for supper, let us know how you celebrate with your black cat on Facebook, Twitter or Instagram. The evenings are getting darker and the pumpkins are aglow - it must be time for Halloween! 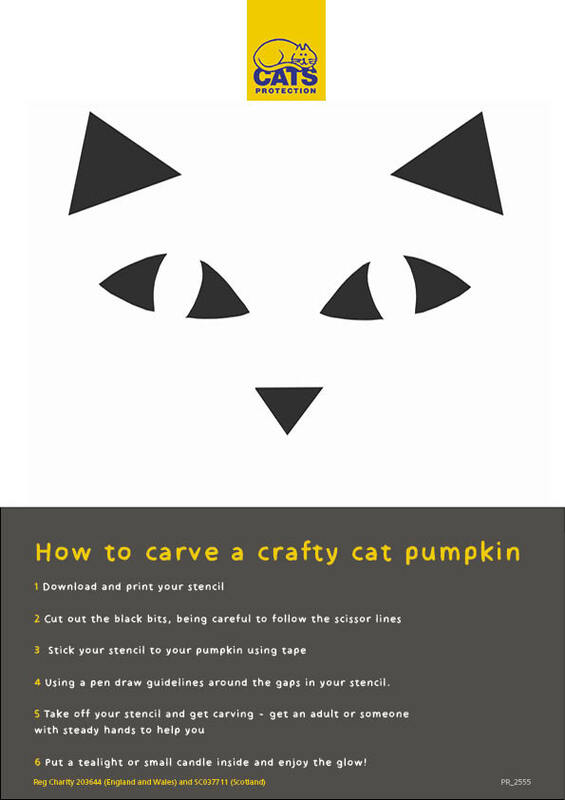 To celebrate, we've put together our own cat-themed templates to use when carving your pumpkin. Choose from two templates, both featuring magnificent moggies. One is spookily simple and the other is devilishly difficult! 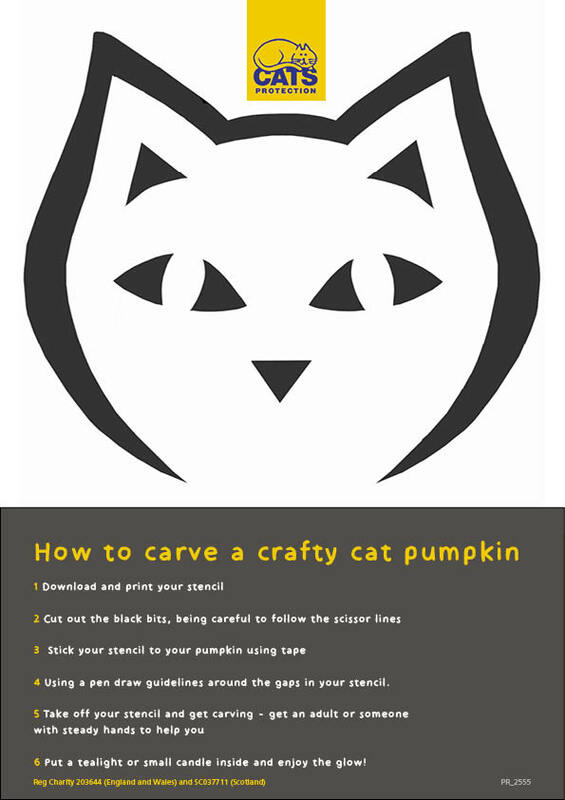 Click on each template to download, print them and follow the instructions before enjoying the glow of your gorgeous cat pumpkin. 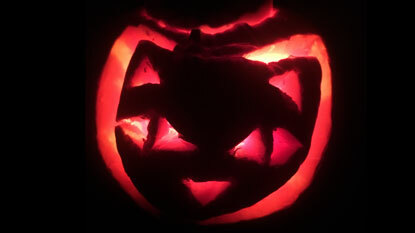 Remember: keep lit pumpkins away from your own feline friend at all times. For more advice on keeping your cat safe this Halloween, take a look at our online guide. 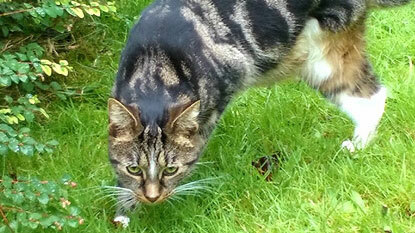 This post has been written with the help of Cats Protection's Aberystwyth & District Branch. Bolt first arrived at the Aberystwyth & District Branch of Cats Protection in June after being found as a stray. Although he was being regularly fed by a local resident, he appeared sodden from rain and bedraggled. With a floppy left ear and a few scars, it was apparent he had been in a few fights. When Bolt arrived at the branch, it was soon clear that he was a lover of food. Whatever he was given, he wolfed it down and looked for more – the branch even considered naming him Oliver! This was thought to be a practice he’d picked up from being a stray and not knowing where his next meal would come from. Bolt also had a huge swelling on his face. The bulging mass was so huge, it caused his right eye to remain closed and was a serious concern. On visiting the vet, he was sadly diagnosed with cancer and it was advised that the affected area should be cut away. Struggling to come up with a name quickly, one of the branch’s volunteers came up with the name ‘Bolt’ – perfect for a cat that is quick on his paws. The vet also suspected that Bolt had, at some point, been run over, as his hind legs were stiff and fairly unstable. 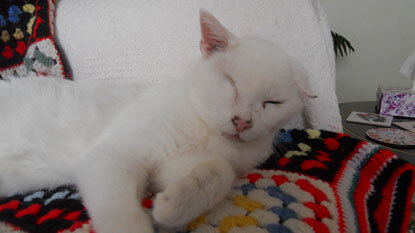 It was found that he was also suffering from arthritis, again as a result of his time on the streets. Slowly recovering from his operation, Bolt became more confident and affectionate. While he was in the branch’s care, he stole the hearts of both the volunteers and staff working there and was known to regularly sit on laps while being stroked, purring and dribbling. He was eventually homed and has quickly settled into his new home. He particularly enjoys his owner’s company and still has a huge appetite! National Black Cat Day: Nominate your black cat hero to win! Who are your heroes? Are they super-powered comic-book stars? Or are they the unsung champions who improve your everyday life? Perhaps a friend or family member comes to mind - or maybe a beloved pet. Sadly, not all heroes get the recognition they deserve. While black cats can be true friends and constant companions, they often go unnoticed compared to their colourful counterparts. Research from last year shows that black cats take on average 13% longer to rehome than a cat of any other colour. This National Black Cat Day, that’s all about to change. We’re raising awareness about our dark-furred defenders by asking black cat lovers across the UK to tell us what makes their cats heroic. We’ve already had hundreds of entries across Twitter, Facebook, Instagram and our dedicated competition page. 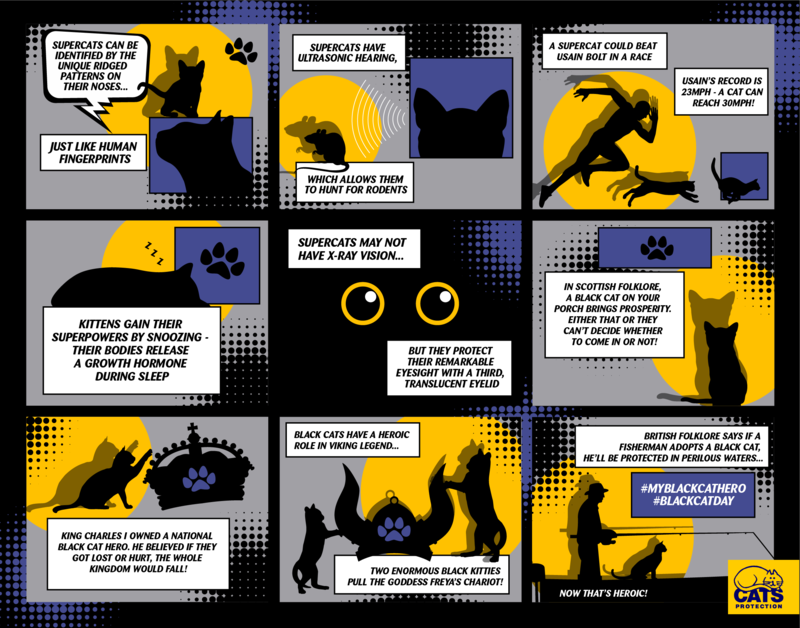 We will choose seven intrepid cats to form a league of heroes, dedicated to raising awareness about black cats and finding them happy homes. Our lucky winners will each get their paws on a selection of feline-friendly goodies including Cats Protection Shop treats, a FreakMEOWt catnip toy and more. On top of this, one supreme supercat owner will receive exclusive artwork from Simon’s Cat and 2 x tickets to the National Cat Awards. To get involved, simply submit a photo of your beautiful black or black-and-white cat and tell us why they’re your hero to be in with a chance of winning. 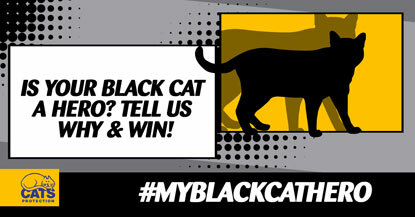 We’ll choose our favourites and announce the winners on 27 October, National Black Cat Day. For full terms and conditions, visit the Cats Protection website. If you don’t yet have a black cat hero in your life and you’re thinking of adopting, search for happy, healthy cats via our find-a-cat tool. Search by location and lifestyle and find the perfect supercat for you or your family. You can also help support our black cat heroes by texting KITTEN66 to 70660 to donate to our heroic team of volunteers, or pick up a gift for a good cause in the Cats Protection Shop. From homeware to accessories, we’ve got everything you need to represent on behalf of black cat heroes everywhere. Have you ever worried about or struggled to find someone to look after your cat and other pets when you go away? Do you have pets that need that little bit of extra care while you are on your travels? Cats Protection’s partner TrustedHousesitters may well have the solution you have been searching for! We appreciate that leaving your pets when you go away can be a stressful time for both you and them. This is why we have partnered with TrustedHousesitters to help you keep your cat, and any other pets you own, happy and healthy at home when you travel. They offer the perfect solution to help avoid the stress and worry of who will care for your pets while you are away. TrustedHousesitters launched in 2010 with a simple mission: to keep pets happy and safe in their own homes. Since then the website has grown quickly into an incredible global community of pet lovers who help each other travel. When Andy Peck, the founder and CEO of TrustedHousesitters, was inspired to launch the company, he focused on solving one problem: keeping pets happy at home when their owners go away. Knowing that many people struggle to find adequate pet care, the first step was to create a platform where owners could find sitters who would care for their pets in exchange for a free retreat. Andy went backpacking around the world, recruiting on both sides as he went. Seven years later TrustedHousesitters is the world’s largest house and pet sitting site with a community of over 500,000 pet lovers from 150 countries. Their sitters have received five-star ratings from thousands of home and pet owners all over the world, so you can travel with peace of mind that your pets are happy at home. Once you join TrustedHousesitters you are able to connect with verified and experienced in-home sitters who will care for your pets every time you go away. You can even sign up to become a sitter too. It’s easy to sign up for an annual TrustedHousesitters membership online and they are also giving our supporters a 15% discount on the cost of membership. Simply visit the TrustedHousesitters website and sign up as either a ‘Home and Pet Owner’ or a ‘Housesitter’. To claim your exclusive 15% membership discount, make sure you use the code CATSPROTECTION02 at the checkout. You will also be supporting Cats Protection too, as TrustedHousesitters will make a donation to Cats Protection for every new membership using this code. As the thousands of cat videos on the internet prove, we can’t help but find the behaviours of our feline friends endlessly entertaining. Whether they’re going crazy for a catnip toy, sleeping in an unusual place or pushing something off of an otherwise empty table, they are truly fascinating to observe. All of these behaviours are part of what makes a cat a cat, but where do they come from? Many are evolutionary or inherited but some will also be influenced by the individual cat’s previous experiences and are therefore learned. There are several ways in which cats can learn new behaviours, so to explain them, Cats Protection has created an animated miniseries called Biscuit Quest. In each video, Tiddles the cat gets to grips with a new learning theory as she tries to get her paws on some tasty cat biscuits. The first video is all about classical conditioning and shows Tiddles learning where her food is kept. Part two shows why Tiddles doesn’t learn through imitation, but humans do! Part three sees Tiddles using trial and error to try to open the biscuit cupboard. Finally, in part four, Tiddles gets the biscuits! As she is rewarded for her behaviour with food, she has learnt that it will have a successful outcome and so knows to try it again. To find out more about understating your cat’s behaviour, take a look at the cat care leaflet on Cats Protection’s website. Concerned about your cat's health? This week, Cats Protection vet Sarah hosted a live Q&A on Facebook to answer some of your questions. Question: We have four cats, but one of them (he's a boy) has a rather sensitive tummy. Any change in food or temperature can make his stool soft or running and there's rarely some blood in in it too. Is it normal as he doesn't do this all the time? Answer: It would be worth checking this with your vet so that they can examine him and comment more specifically for him. However, many cats have a sensitive bowel and what you are describing sounds like colitis. Usually cats with this condition are still well in themselves and happy to eat, but may have occasional soft stools with perhaps a bit of fresh blood there. Diet changes and stress can be a cause of flare ups. For more info, check out our advice leaflet on digestive disorders here. Question: My cat is terrified of any noise and runs away. How can I help him calm down? Question: My cat has got a cyst near his shoulder. It is growing and moving from left to right. We checked it before but have been told it is not harmful. Our cat is 10 and had cancer two years ago. I’m hesitant to have it checked out because of the fear of operation. Is there any advice on what to do with the cyst or can it be remove without operation? Answer: I can understand your concerns and the idea of an operation can be scary. I would encourage you to talk to your vet, as there may be many different options for treatment and not necessarily just surgery. As an aside, general anesthetics are generally very safe for cats nowadays. Modern drugs and monitoring machines mean that anesthetic complications are less and less common. Please check out our leaflet ‘You and your vet’: www.cats.org.uk/.../cat.../VG19_You_and_your_vet.pdf - there are lots of tips on how to make the experience as stress-free as possible. Question: I adopted a kitten from Cats Protection three weeks ago. She is such a cutie and we love her! I was just wondering why she sleeps with her eyes slightly open and almost boss-eyed? Sometimes she even shakes her head too. Answer: Thank you so much for giving a CP cat a home! ;) It looks like when she is asleep, her eyelids are slightly open (this is pretty normal) and you can just about see her third eyelids coming across (again, this is normal). 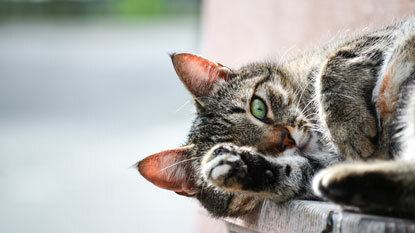 Cats have a third eyelid in each eye which looks white when it is across the eye. The third eyelid gives a bit of extra protection to the eye. The head shaking might be worth a vet check however – it could be parasites or a problem with the inner ears for example. Make sure you are up to date with flea control. Question: There are a number of cats in our area who scavenge from bins. They do belong to a neighbour - should we be worried about them? Ours are definitely well-fed and never scavenge from bins so we were concerned it may be a care issue. Answer: Some cats are particularly food motivated and will look for food even if they are well-fed. Cats Protection would recommend using bins with a secure lid, to try and prevent cats from scavenging for them. Cats (like people) can get food poisoning and there may be other stuff in the bins that perhaps won't go down too well if eaten either! 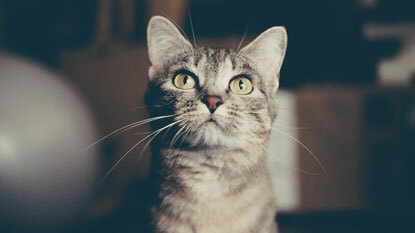 For more advice about looking after your cat, head to the cat care section of our website. If you do have any concerns for your cat's health, please consult your vet. This post has been written with the help of Cats Protection's North Birmingham Branch. 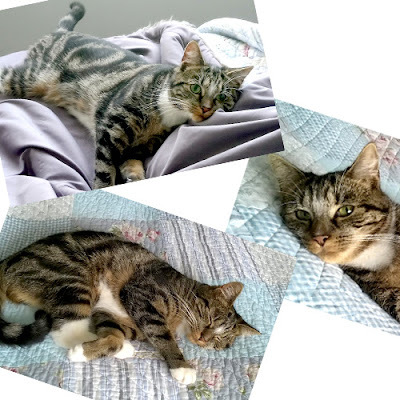 This week has seen another successful rehoming by the North Birmingham branch of Cats Protection, who managed to help Mitsy find her forever home. Mitsy, who is just under a year old, was taken to the vets with an injured leg. With her life ahead of her, it was decided that amputating her leg was the best course of treatment, with the branch agreeing to pledge the money for her operation. After she had recovered, she was put up for adoption with the hope she’d find some loving owners to look after her. Kim and Paul soon spotted her on the website, and decided to make a visit. Kim says: "We saw Mitsy on the North Birmingham Cats Protection website and to be honest, weren’t sure about taking on a three-legged cat. My husband and I talked it through and thought, why not give a home to the neediest cat with the saddest background, rather than a perfect kitten? After going through the homing process, we decided she was the one for us." With Mitsy’s amputation so recent, she was still adapting to life as a three-legged cat. A wide shelf had been made for her by fosterers, with a special ladder that gave her access to her sleeping quarters. Once she arrived at Kim and Paul’s house, however, she quickly improved, progressing to making her way up and down the staircase and exploring anywhere she could! Kim says: "She wears herself out running about everywhere and then has a lovely rest sleeping in the sun on our bed. We didn’t allow previous pets on the bed, but how could we say no to Mitsy when it’s such good physio for her to jump up? And displaying such happiness to have a home and comfy bed too?" Mitsy now has a new lease of life, and she’s made her new owners very happy too. Arthritis is a common condition in humans that causes pain and inflammation of the joints but did you know that cats can have it too? It’s particularly common in cats aged 12 or over but because they are very good at disguising pain it can be very difficult to detect. 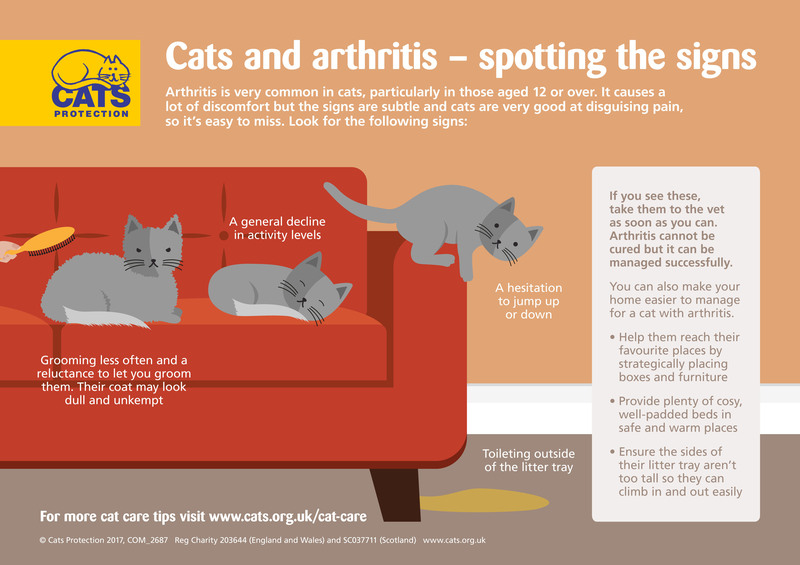 For National Arthritis Week (9 - 16 October 2017), Cats Protection has put together a useful infographic to help you identify the common signs of arthritis in your cat and give you some handy tips for managing their condition. If you notice any of these signs, the first thing you should do is take the cat to the vet. 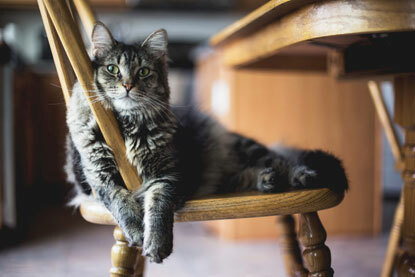 Unfortunately there isn’t a cure for arthritis but there are a few things you can do to make your cat’s life a little more comfortable. 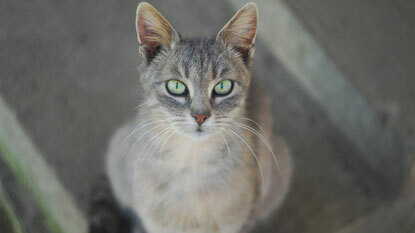 For more information on cat care, visit the Cats Protection website. Feeling concerned about your cat’s behaviour? Behaviourist Nicky Trevorrow recently took to our national Facebook page to answer live questions from cat owners. Question: We rescued two gorgeous girls a few weeks ago and I've noticed one of them is eating all the jelly from both dishes before the other gets a look in. I've tried calling both girls to eat at the same time but if the quieter of the two doesn't come she's missing out on the good stuff. Putting it out at separate times doesn't work either. Any ideas? Answer: Lots of people have this problem. It would be worth separating them during feeding times. Watch your cats closely to work out which areas of the house they prefer to spend time in. If your quieter cat prefers to be in the bedroom, then I'd suggest feeding her there and the more confident one downstairs with the door shut between them. You can also get microchip cat feeders that read the cat's unique microchip number and will only 'open sesame' for the right cat! Question: My cat has brought three mice into the house for the third day in a row. The first two in my daughter’s bedroom where she likes to sleep with them at night and then the third this morning she was just bringing in. Are these gifts and is there any way we can stop this? 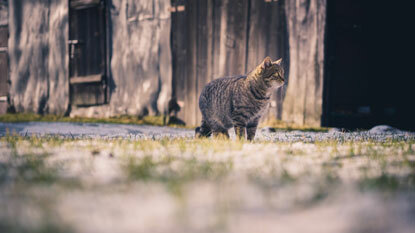 Answer: While previously it was thought that cats brought prey back to the house as a gift, the current thinking is that cats often prefer to bring prey back to their core territory, which is generally the house. This is a natural instinct in all cats (even if some don't actually hunt, they have the ability to), so it would be impossible to stop. However, you can reduce the amount a cat hunts by keeping the cat indoors during dawn and dusk when its prey is most active, placing a quick release collar with a bell on it around the cat’s neck and most importantly, giving the cat a suitable alternative outlet for hunting behaviour such as interactive play sessions with fishing rod toys (ones with feathers at the end are very popular). Always store the fishing rod toy out of the cat's reach after play is over for health and safety reasons. Question: Why does my cat claw me in the mouth every morning while I'm sleeping? Answer: I know of several cats that try the exact same tactic! It's to wake you up either for attention, food, play, or perhaps outdoor access. The first thing is to figure out what the cat wants and then try to give the cat what it needs without having to wake you up. For example, if it wants outdoor access to go to the toilet, provide the cat with a litter tray at all times. If it's for food, gradually introduce your cat to feeding enrichment such as putting biscuits into a cardboard egg box and showing them (during the day) how to use it. Once the cat has the hang of it, you can then leave an egg box with a small portion of dry food from their daily allowance out just before bed. Question: When are rescue cats meant to go outside? I was told two to three weeks and someone else said six weeks. When I hold her by the backdoor or at the window she looks terrified of the outdoors so I don’t mind her just staying in if she wants. We’ve had her two weeks, so she likes her corners. Do you live in a cat-crazy hotspot? The United Kingdom is a nation of pet lovers, with fabulous felines and cute canines the most popular furry companions by far. But which areas are particularly cat-crazy and which are more of a doggy domain? Sainsbury Bank surveyed over 4,000 Sainsbury’s customers around the UK to find out more about which pets live where and now the results are in. Although the canines came out on top overall, with 74% of people favouring dogs compared to 26% preferring cats, certain areas are clearly populated by kitty lovers. Norwich has the highest level of cat ownership in the UK (44% of households have a cat) and alongside Brighton also has the joint highest percentage of people who prefer cats to dogs (40%). The survey also asked pet owners if they think their pets benefit their health and 85% of those who own a cat said that they feel happier and have a better quality of life because of their moggies. To find out whether you live in an area of feline fans or dog devotees, simply visit the Sainsbury’s Bank interactive map and enter your postcode. You can also see a breakdown of the results in the infographic below, including which cat and dog breeds are the most popular in each area. Do you live in a UK cat hotspot? Let us know why you think your area is particularly purrfect for moggies in the comments below.